All Things Crafty: Great Odds of Winning GiveAway - Last day to Enter! Great Odds of Winning GiveAway - Last day to Enter! Just a little over 24 hours left to enter my Bloggiversary Giveaway. A chance to win 2 Jelly rolls and more. Leave a comment on the Bloggiversary Posting and add your name to the giveaway. Not much crafting this weekend. Went to visit with family and had a great time! I did get a chance to stop by Joanns and pick up some patterns. I thought I would try some teddy bear patterns using a purchased pattern. I had no idea how expensive patterns were now. For tissue paper, please... $15.95 each is a shame! Just show's you how long it's been since I bought a pattern. 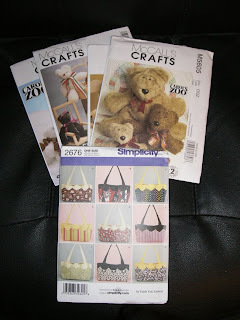 But, I at least used a 50% off coupon for one I really wanted (another purse pattern) and then bought some McCall's patterns for 1.99 sale price. Quilt show or Cabela's - What's a girl to do? Bold Binding Option - Too Much? ?